Tabs have become the standard in web browsers to browse Internet pages. They have several advantages like being space efficient or easier manageable. The first application for Windows that introduced tabbed browsing was QT Tab Bar which added that functionality to Windows Explorer. Windows Tabifier takes the concept a step further by breaking out of the Windows Explorer limitation. It can be used to put any application or window that is currently running in a tab. It will create a new window if the process is initiated and add all selected applications, processes, folders and files into tabs in there. 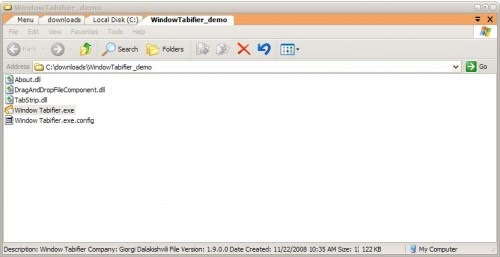 Windows Tabifier provides two ways of adding windows to the tabbed browsing interface. The first is by using the System Tray icon to move open windows into the interface. This can be done in just a few clicks and has to be done at the beginning to create a tabbed browsing window. The second option is to drag files or folders into the tabbed browsing interface once it has been created. This will automatically create a new tab in the interface. You can browse in the interface by hovering the mouse over the tabs or by using the keyboard shortcut [CTRL 1-9]. It is possible to create multiple windows for tabbed browsing, for example one that contains all Windows Explorer folders, one for Internet and one for multimedia. The Taskbar icon will always display the icon of the active Window in the Taskbar. Minimizing the tabbed browsing window will move it into the System tray. Windows can naturally be released from the tabbed browsing interface at any time. Windows Tabifier provides the means to tidy up the Windows Taskbar by joining multiple windows into one window. Users who have to cope with tiny computer screens and those who like their desktop to be organized and clean all the time should give this application a try. The software program is Open Source and portable. It does require a version of the Microsoft .net Framework but the software developer fails to mention which. It was tested with the Microsoft .net Framework 3.5 SP1 on a Windows XP SP3 test computer system. Kinda cool but not very functional or practical. Tabbed browsing really needs to be integrated with Windows Explorer. It amazes me how MS can continue to ignore the trends. It took them forever to add it to Internet Exploder. Even Vista still doesn’t have a tabbed Explorer. Seems a bit “head in the sand”-ish to me. thanks for this innovative application. can u make it with cascade, tile horizontal and tile vertical functionality (arrange manually)? so this app maybe the solution.